Today's Image of Mars is of Deimos, the smaller and furthest of Mars' two moons. 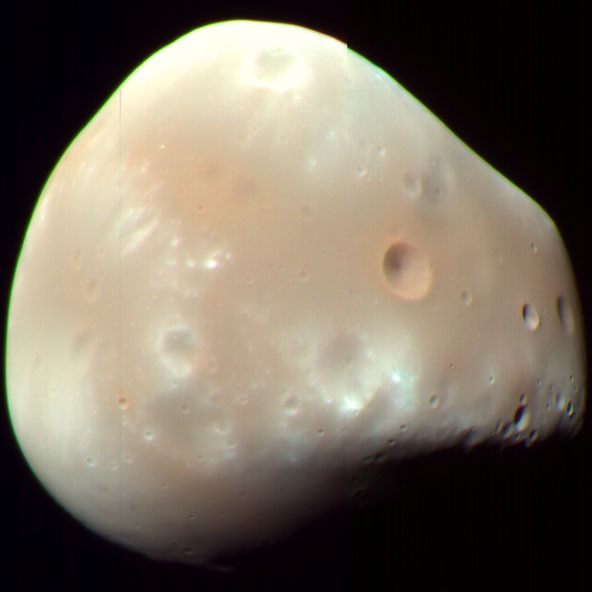 As you can see Deimos is lopsided, but it has an average diameter of only 12.4km. Unlike Earth's moon, if you were looking up into the sky from Mars, Deimos would never appear brighter than Venus does from Earth. Deimos cannot be seen on Mars at latitudes greater than 82.7° because it orbits Mars almost exactly around its equator. This image was taken by Mars Reconnaissance Orbiter on Feb 12 2009. Clicking on it will take you to the very detailed Wikipedia page.